Happy 1 Year Blogiversary, Ski Boots in the Kitchen! It seems crazy to me that a year has gone by since I decided to start this blog. My first post was one of my favorite childhood fall recipes- Stew in a Pumpkin… I never thought a year later I’d be posting my 74th recipe! Stew in a pumpkin was a recipe my mom always made for us as kids and she still makes it for my nieces and nephew- we were always so excited to see the whole pumpkin on the table filled with stew! It’s usually a good excuse to carve pumpkins too! My niece dressed up for Halloween and ready to eat Stew! Nothing says fall better than a Sunday afternoon watching football and eating some hearty stew or chili. One pot wonders, crock pot magic- whatever you like to call it soups are easy, cheap and feed all the hungry boys that have come over to your house, taken over your couch and drink all the beer! But serving chili without cornbread is like serving lamb without tuna fish… wait I think I meant to say, its like serving spaghetti with out meatballs (that was for all you Big Daddy movie fans…) anyways, you get the idea. What is worse than chili without cornbread? Dry, boring, stale cornbread that tastes like sawdust. That is kind of how I feel about a lot of cornbread, ohhh but not this recipe. The secret ingredients? Well not that secret because I’m going to tell you… Crushed pineapple, creamed corn and pepper Jack cheese! Don’t worry if the mixture looks curlded, thats normal! This recipe was one my mother got out of Blanchard’s Cookbook but it was also one of the recipes I got at my bridal shower! Everyone that came to my bridal shower was asked to bring a copy of their favorite recipe for me to add to my collection! (that way I’ll always know your favorite dish when you come over for dinner!) This was the recipe Diane S. brought for me! So thank you Diane and mom for the recipe because it has become one of my favorites too! 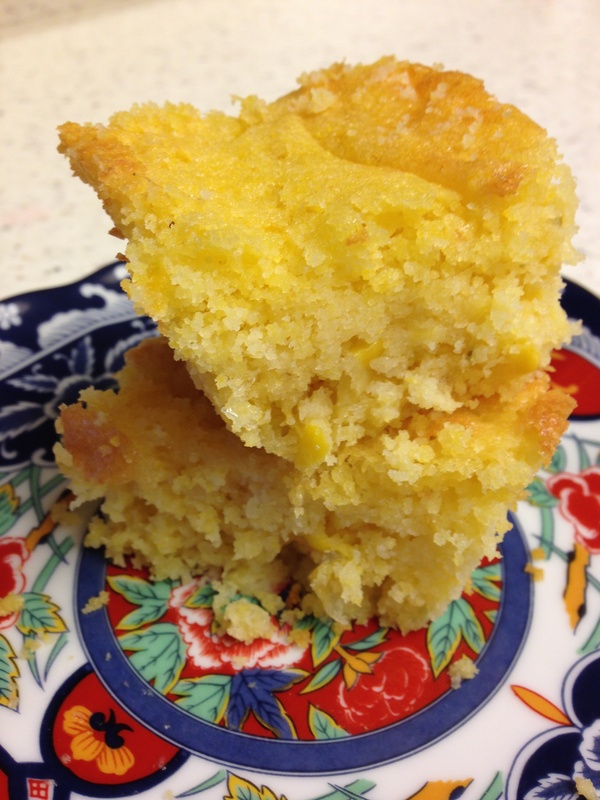 You’ll never think of cornbread the same after eating this deliciously moist and yummy treat! It would also make a great addition to your holiday meal and it freezes well too! So make up a big ol’ pot of chili, a big ol’ batch of cornbread and get the best spot on the couch. Enjoy! Butter and flour a 9-inch square glass cake pan. (You can use a metal cake pan, but glass works best). In a medium bowl, whisk together the flour, corn meal, baking powder, and salt, and set aside. (You can use gluten free all purpose flour from King Arthur for GF option). In a mixer, cream the butter and sugar. Add eggs on at a time, beating after each addition. If the mixture starts to look curdled at this point its OK.
Add the corn, pineapple, and cheese, and mix to blend. On a low speed, add the dry ingredients and mix until blended well. Pour the batter into the prepared pan and bake until golden brown around the edges and a tester stuck in the center comes out clean, about 1 hour. 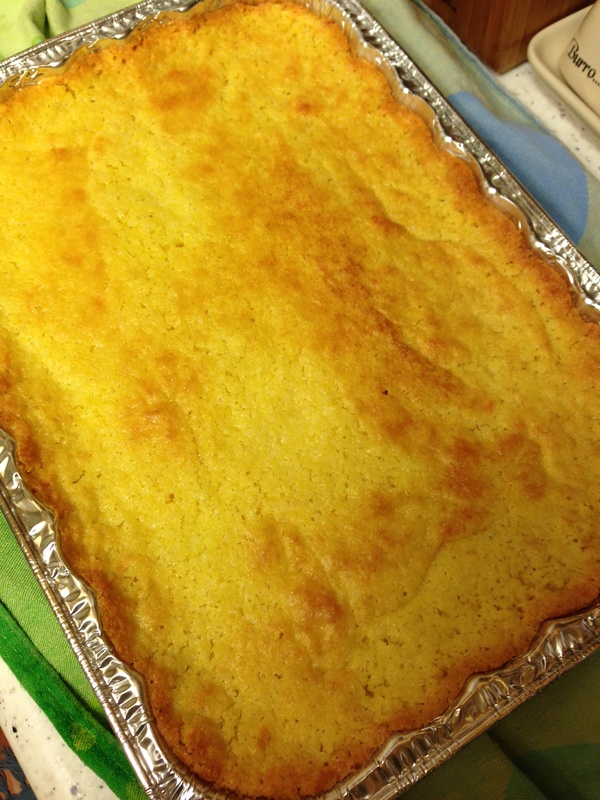 *to freeze- let cornbread cool completely before cutting and removing it from the pan. Double wrapping in plastic and freeze. Recipe from Blanchard’s Table Cookbook. 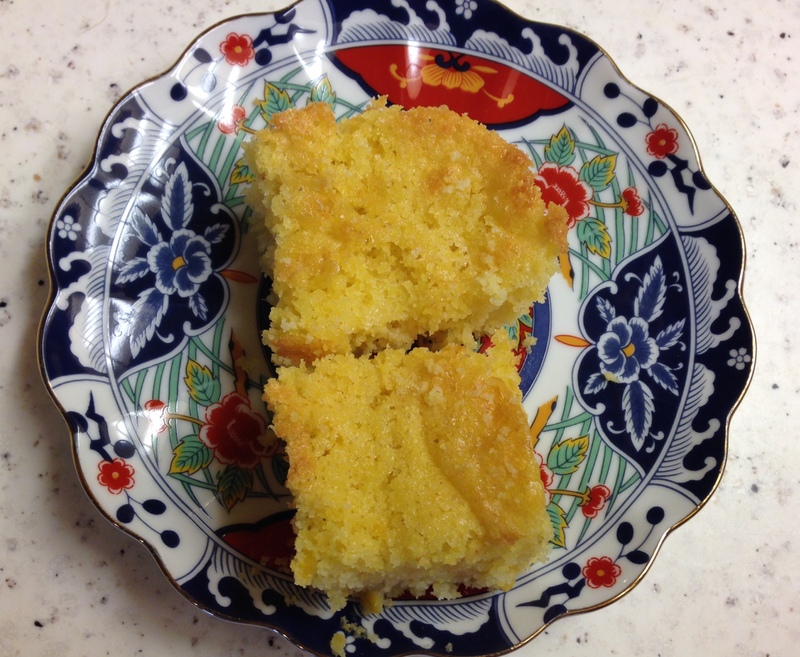 This entry was posted in Baked Goods, Holiday Dishes, Recipes, Sides and tagged Blanchards cookbook, Blanchards cornbread, Caribbean Cornbread, chili side, Cornbread, creamed corn, Holiday dishes, pineapple, stew side by skibootsinthekitchen. Bookmark the permalink. Hey Perry! I made this cornbread last night (gluten free of course) for a houseful last night at Charlie & Lindsay’s house with a huge pot of chili. It was a huge hit! Thanks for the inspiration! Cindy, this recipe is so perfect with chili, I bet it was delicious! I wish I could have been there with everyone!! Thanks for sharing! I’ve read a few posts here and I can actually relate. I am in love with Marie Callender’s cornbread. They are simple to make and super yummy, especially with honey butter. I’ve been a fan of MC’s ever since I was a little girl, and have fond memories of eating it with my family back in San Jose, CA. Check out their website http://www.mccornbread.com to order your cornbread mix. They also stock a variety of gourmet products I’m sure you will enjoy.